An anaesthetic machine. This particular machine is a "Flow-I" model, manufactured by Maquet, a division of Getinge Group, Getinge, Sweden. The original concept of continuous-flow machines was popularised by Boyle's anaesthetic machine, invented by the British anaesthetist Henry Boyle at St Bartholomew's Hospital in London, United Kingdom in 1917, although similar machines had been in use in France and the United States. Prior to this time, anaesthesiologists often carried all their equipment with them, but the development of heavy, bulky cylinder storage and increasingly elaborate airway equipment meant that this was no longer practical for most circumstances. Contemporary anaesthetic machines are sometimes still referred to metonymously as "Boyle's machine", and are usually mounted on anti-static wheels for convenient transportation. Many of the early innovations in anaesthetic equipmentin the United States, including the closed circuit carbon-dioxide absorber (a.k.a. the Guedel-Foregger Midget) and diffusion of such equipment to anaesthesiologists within the United States can be attributed to Richard von Foregger and The Foregger Company. Systems for monitoring the patient's heart rate, ECG, blood pressure and oxygen saturation may be incorporated, in some cases with additional options for monitoring end-tidal carbon dioxide and temperature. Breathing systems are also typically incorporated, including a manual reservoir bag for ventilation in combination with an adjustable pressure-limiting valve, as well as an integrated mechanical ventilator, to accurately ventilate the patient during anaesthesia. Anaesthetic machines are distinct from anaesthesia carts, which hold various adjuncts for anaesthesia such as intravenous medications, syringes, needles and other items of equipment that the healthcare worker providing anaesthesia might need. In dentistry a simplified version of the anaesthetic machine, without a ventilator or anaesthetic vaporiser, is referred to as a relative analgesia machine. By using this machine, the dentist can administer a mild inhalation sedation with nitrous oxide and oxygen, in order to keep their patient in a conscious state while depressing the feeling of pain. an oxygen failure alarm (a.k.a. 'Oxygen Failure Warning Device' or OFWD). In older machines this was a pneumatic device called a Ritchie whistle which sounds when oxygen pressure is 38 psi descending. Newer machines have an electronic sensor. hypoxic-mixture alarms (hypoxy guards or ratio controllers) to prevent gas mixtures which contain less than 21-25% oxygen being delivered to the patient. In modern machines it is impossible to deliver 100% nitrous oxide (or any hypoxic mixture) to the patient to breathe. Oxygen is automatically added to the fresh gas flow even if the anaesthesiologist should attempt to deliver 100% nitrous oxide. Ratio controllers usually operate on the pneumatic principle or are chain linked (link 25 system). Both are located on the rotameter assembly, unless electronically controlled. ventilator alarms, which warn of low or high airway pressures. The functions of the machine should be checked at the beginning of every operating list in a "cockpit-drill". Machines and associated equipment must be maintained and serviced regularly. Older machines may lack some of the safety features and refinements present on newer machines. However, they were designed to be operated without mains electricity, using compressed gas power for the ventilator and suction apparatus. Modern machines often have battery backup, but may fail when this becomes depleted. The modern anaesthetic machine still retains all the key working principles of the Boyle's machine (a British Oxygen Company trade name) in honour of the British anaesthetist Henry Boyle. In India, however, the trade name 'Boyle' is registered with Boyle HealthCare Pvt. Ltd., Indore MP. A two-person pre-use check (consisting of an anaesthesiologist and an assistant) of the anaesthetic machine is recommended before every single case and has been shown to decrease the risk of 24-hour severe postoperative morbidity and mortality. Various regulatory and professional bodies have formulated checklists for different countries. A free transparent reality simulation of the checklist recommended by the United States Food & Drug Administration is available from the Virtual Anesthesia Machine web site ( see below) after registration which is also free. Machines should be cleaned between cases as they are at considerable risk of contamination with pathogens. ^ a b c d Steven M. Yentis; Nicholas P. Hirsch; James K. Ip (2013). "Anaesthetic machine". Anaesthesia and Intensive Care A-Z: An Encyclopaedia of Principles and Practice. Elsevier Health Sciences. p. 34. ISBN 0-7020-4420-2. ^ Arbous; et al. (2005). "Impact of anesthesia management characteristics on severe morbidity and mortality". Anesthesiology. 102 (2): 257–68, quiz 491–2. doi:10.1097/00000542-200502000-00005. PMID 15681938. ^ Baillie, JK; P. Sultan; E. Graveling; C. Forrest; C. Lafong (2007). "Contamination of anaesthetic machines with pathogenic organisms". Anaesthesia. 62 (12): 1257–61. doi:10.1111/j.1365-2044.2007.05261.x. PMID 17991263. 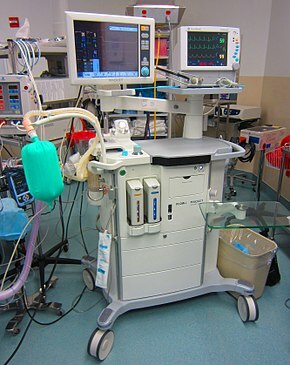 Wikimedia Commons has media related to Anaesthetic machines. History of Richard von Foregger and the Foregger Company — written by his son, R. Foregger, this website chronicles one of the leading manufacturers and developers of anesthesiology equipment in the early 20th century.